Since the mid 80s, French Canadians Voivod have proven to be one of the most innovative and resilient bands out there. From thundering power metal to sci-fi thrashmetal, they have moved through psychedelia and prog rock without losing touch with their roots. Recorded live in 1996 at the Dynamo Festival in Holland and at CBGB's in New York, "Voivod Lives" is an excellent introduction to new fans as well as a new addition to anyone who has managed to keep up with their output over the years. Since the introduction of Eric Forrest on bass and vocals in 1995 with "Negatron", Voivod revitalized themselves as a power trio, and "Voivod Lives" proves they still remain one of the most cutting edge bands in the world. From "Insect" through other highlights like "Tribal Convictions", "Nuclear War", "Ravenous Medicine", "Voivod", and closing with a rousing cover of Venom's "In League With Satan". It's an apocalyptic hi energy ride through their long career since the classic debut "War And Pain" (1984). 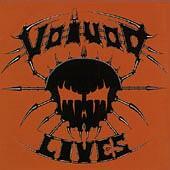 The US edition of "Voivod Lives" comes with two bonus tracks, "The Prow" and "Forlorn". All housed in a stylish digipak with the usual artwork by drummer Away, its a highly recommended purchase.